I recently put a stepper motor on my MM-11 "hybrid" (see: http://www.photomacrography.net/forum/viewtopic.php?t=17656& ) to automate stacking. Turned out to be pretty simple really. It is always nice for me to see what others have done... gets the brain cells working... so Here are a few details that might come in handy for someone else. One aspect that was different from many microscopes is that on this one the entire "head" (trinocular head, objectives, camera) move up and down instead of a stage moving up/down. So the motor needed to be attached to this main unit. This was accomplished by using a 0.19inch thick piece of aluminum plate attached at the bottom as can be seen in the pictures below. The fine focus knob is a large, nicely machined metal piece on this scope and I did not want to remove it or permanently modify it. Since the Nema 17 motor has a 5mm shaft I wanted to put a 5mm shaft on the knob. I found some hubs and shafts that allowed me to do this (details below). It took two different attempts to attach the hub accurately centered. What worked (the second method) was to remove the head and position it "sideways" on a table in a way that the knob pointed straight up but I could still freely turn the fine focus knob on the opposite side. With the 5mm shaft attached to the hub I put a thin, even layer of JB Weld "KwikWeld" on the bottom of the hub. This is an excellent epoxy adhesive and it gives you about 5 or 6 minutes to slightly adjust the position of the part. By rotating the fine focus rapidly from the opposite side, and observing the shaft end, it was quite easy to "eyeball" the hub and shaft to nearly perfect center. After that it was pretty straightforward to align and couple the two shafts. I had a few different couplers. The first one gave me a "wobble" even though I had carefully aligned the shafts. The second one was a different type and it ran perfectly "true"! C) 0.19 inch thick aluminum plate. Without micro-stepping it gives 1 micron movement per step. The controller can micro-step and will provide much smaller steps than 1 micron but I won't need them (perhaps rarely) on this scope because of the objectives I typically use with it. Yeah, me too, thanks Charles. Absolutely delighted to see the WeMacro unit work for you!! I'm not sure if this arrangement will work for me though because I don't have a double movement axis as such, and if I connect the stepper permanently to the fine focus like this it'll stop me being able to fine focus by hand. So I'm thinking something like Rik's hosepipe connector, one that I can slip on and off easily. Labophot-2 has a cover over the fine adjustment that I should be able to use for this. I don't have any machining skills though so the connector to connect the stepper to the scope needs a little thought. Charles, clean and nice implementation, thanks for posting it! Did you be able to buy the Wemacro without rail? 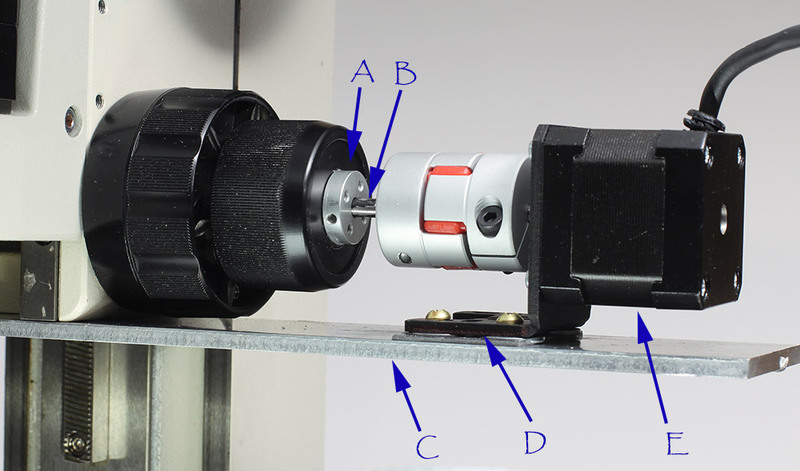 This is also my main fear, but I think that the shown setup also provides the solution: I guess that just unscrewing the locking bolt holding the glued hub (A) and the motor axis (B) will free the fine focus movement, could I be right? Yes, or loosening the coupling that holds the two shafts together? I'm just a little bit unsure of the long-term viability of something that requires me to undo and reset a precise mechanical coupling. I'm sanguine enough to know that if it's a solution that isn't completely idiot-proof, it'll catch me out sooner rather than later. Also, vibrations from the motor. If I could have some sort of join connecting motor and scope which included vibration-eating material as part of that join train that'd give me a tick on a checklist of worst case scenarios. Right now I'm leaning towards somehow bedding the single spare Stackshot motor that I could buy from Cognisys on a bed of sorbothane, below and parallel to the fine focus control, finding 2 matching cylindrical 'knobs' with tracks/notches/tracking, to put on the fine focus control shaft and the stepper motor shaft, and a chain/connector/drive of some sort that sits exactly and predictably in those tracks. Do bear in mind that microscopes are very much virgin territory for me, so my comments are just guesses as to what's needed!!! Pay attention to the part that is attached to the "Z" motor (looks like a cross between a cupcake form and a funnel). I spoke with Jim Averill, the creator of this. That piece is 3D printed from a material that has some flexibility and (for want of a better word) some "stickiness". It is pressed onto the fine focus knob when you want to use the motor. Pull it away and you are free to manually use the fine focus. My tentative plan was to get one of the Pololu hubs listed above. Then find a suitable sized funnel. Cut the spout off the funnel and figure out a way to attach it to the motor hub (Probably that same JB Weld epoxy since it would give you the opportunity to run the motor slowly as it hardens and thus allow you to "center" the funnel). Next I would get some Sugru. Put some release agent on the fine focus knob. Put a blob of the Sugru into the funnel and press it up against the fine focus knob to create a custom fit mold inside the funnel. Let the Sugru harden and then pull it off. I would then put one of my mini Arca clamps at the bottom of the motor mount. Have it "ride" on an Arca plate. You could then slide it against the fine focus knob when needed or back it off (or remove it completely) when not needed. Using Sugru as mentioned above would mold a custom fitting to a particular knob. 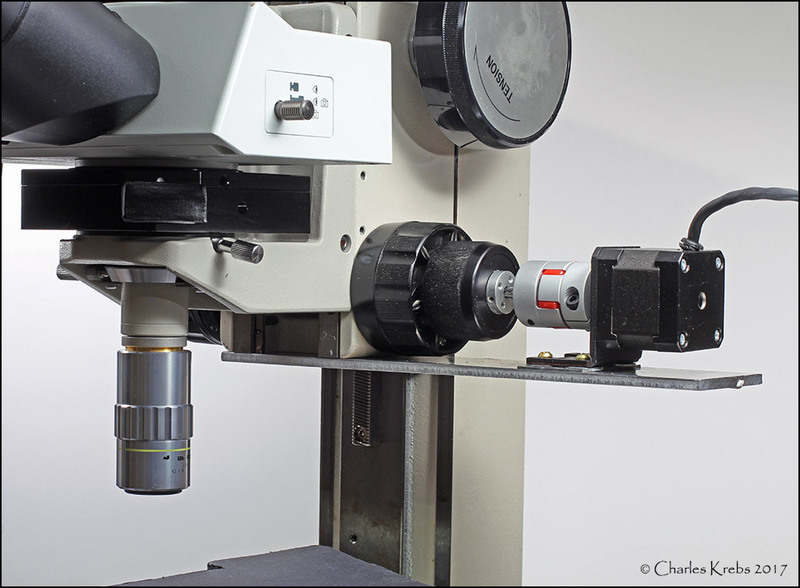 If you has several microscopes with different knobs it should be possible to make a "generic" one that could fit a range of knob sizes. Instead of using Sugru to make a custom "fit", line the funnel with some adhesive backed rubber or perhaps dip it into one of those "liquid rubber" materials. With the MM-11, the way I have been using it I rarely used the "built-in" Nikon fine focus. I use the Zeiss stage to hold subjects and that has a more convenient fine/coarse focus. The Nikon fine focus on my MM-11 does not have a calibration dial either so I used the Zeiss stage for both fine focus and stacking. So fastening the stepper to the knob was no great loss at all. But with most conventional microscopes I can fully understand the desire to not "cripple" the fine focus with a (semi) permanent attachment to a stepper. I'm pretty confident the method just discussed could work quite nicely. It does not have to be. In my Arduino system, when not stacking the fine focus motor is under the control of a rotating digitizer that, in essence, transmits the motion of the digitizer to the fine focus and works like one of the ergonomic (and expensive) remote focus controls one sees in high grade research microscopes. So...if the stepper motor is not under current, does it can freely rotate? Yes, but remember that you should never rotate it manually with power applied. You can potentially blow out the driver. If you try this would you come back and comment on whether or not the motors detents interfere in any way with focusing? I'd also like to point out that you can get motors with double shafts. With a knob on the outboard shaft you wouldn't need to reposition the motor assembly if you wanted to focus manually. I guess the down side of that is that it might make it too convenient or too tempting, leading to drive failures because the power wasn't turned off. What if you just placed a simple switch in line with each motor winding. Example, push the Red button to disengage the stepper windings and allow manual rotation. Release the Red button to re-engage the motor?